A reliable source for Wire Rope information and a resource for accessing leading Wire Rope and suppliers. Wire Rope Wire rope is a type of cable made up of several strands of wire tightly wound together around a larger core. 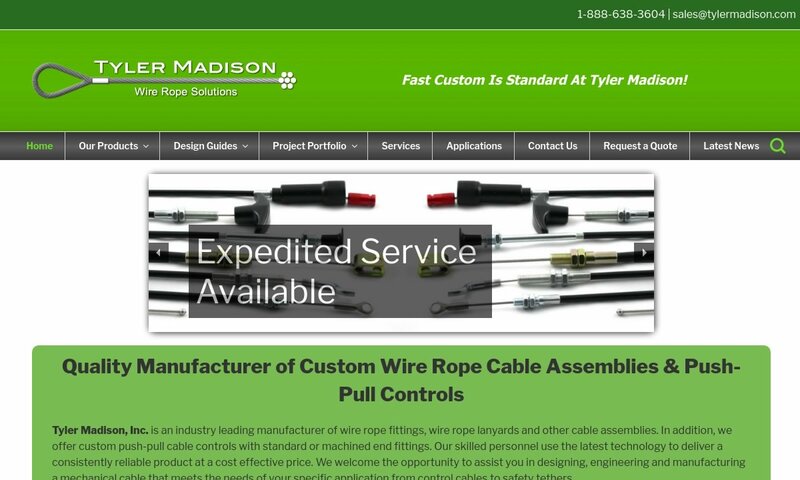 Tyler Madison manufactures precision-quality wire ropes for a broad range of industries. They provide companies with a full line of products that are used for powering, lifting, hanging, pulling, braking, suspending & winding of 270lbs - 14,400 lbs tension. 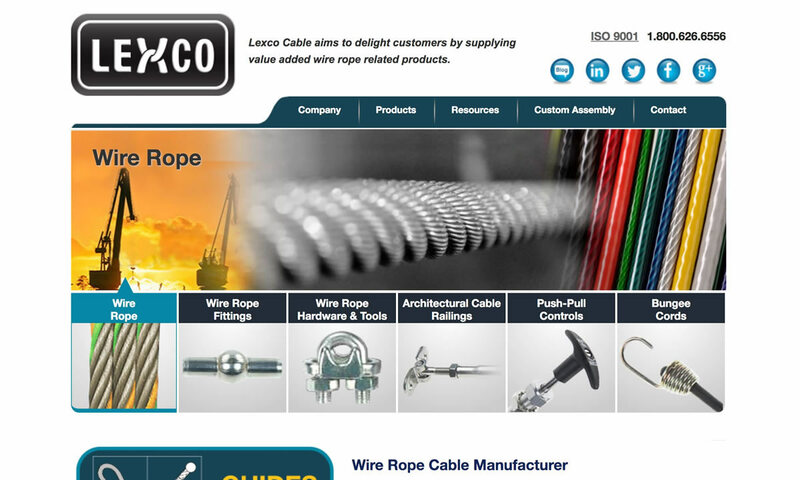 Serving a multitude of industries, Lexco Cable proves to be versatile wire rope manufacturers through diverse applications. Lexco Cable displays consistency and dependability with an on-time delivery percentage of 99.4%. 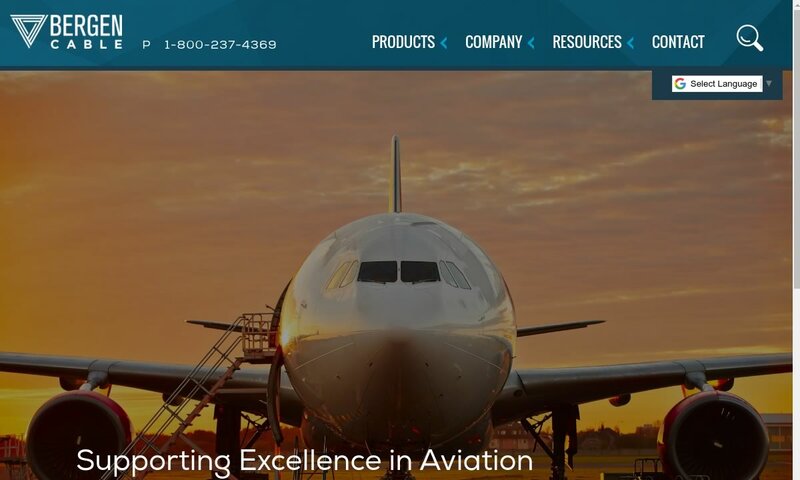 As leading innovative wire rope manufacturers, Bergen Cable Technology has been providing engineering assistance for well over half a century, helping customers develop cost effective, durable solutions. 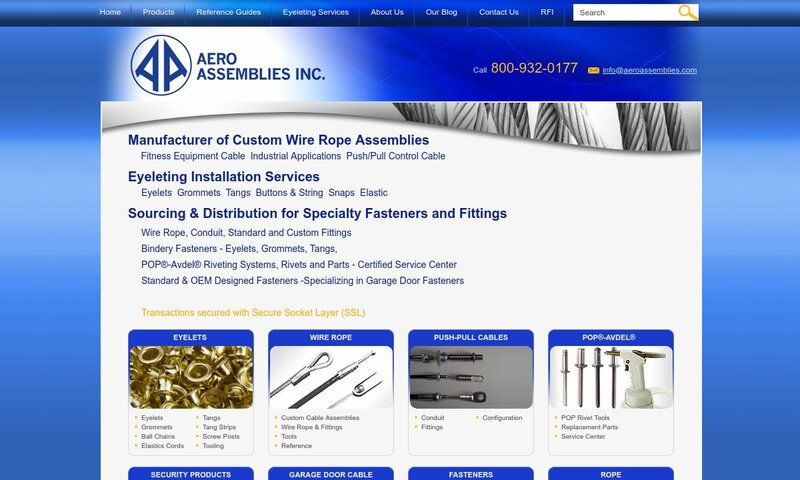 Aero Assemblies, Incorporated strives to make every effort, as dedicated wire rope manufacturers, to maximize product value throughout the manufacturing process. 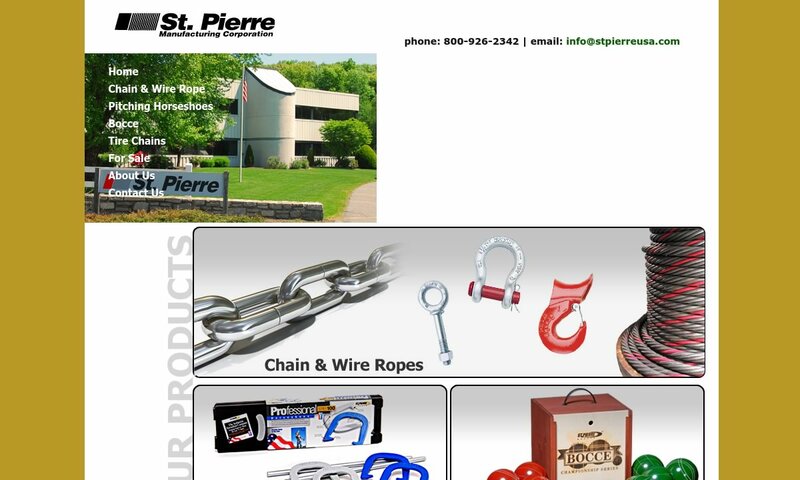 As family-owned wire rope manufacturers, St. Pierre Manufacturing provides a variety of products and services for a wide range of satisfied customers around the world. Wire rope manufacturers produce their products in order to provide a high load capacity, versatile alternative to weaker ropes like manila rope or hemp rope. Wire rope products are used for a wide variety of motion transmission applications, among them: lifting, baling, tie down, hoisting, hauling, towing, mooring, anchoring, rigging, cargo control, guidance and counterbalance. They can also be used as railing, fencing and guardrailing. Wire rope is a must-have for many heavy duty industrial applications. From mining to forestry to marine and beyond, there’s wire rope for almost every job. Some of the many industries in which wire rope is popular include: construction, agriculture, marine, industrial manufacturing, fitness, sports and recreation (plastic coated cables for outdoor playground equipment and sports equipment), electronics, theater (black powder coated cables for stage rigging), mining, gas and oil, transportation, security, healthcare and consumer goods. 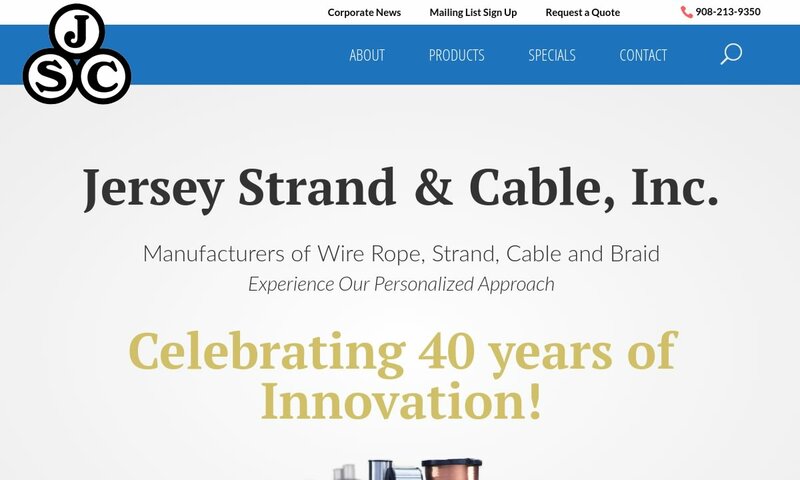 Wire Rope – Carl Stahl Sava Industries, Inc.
Wire rope as we know it was invented just under 200 years ago, between 1831 and 1834. At that time, the goal was to create a rope strong enough to support work in the mines of the Harz Mountains. Invented by Wilhelm Albert, a German mining engineer, this wire rope consisted on four three-stranded wires. It was much stronger than older rope varieties, such as manila rope, hemp rope and metal chain rope. In 1841, an American manufacturer named John A. Roebling began producing wire rope for suspension bridges. Soon after, another set of Americans, Josiah White and Erskine Hazard, started incorporating wire rope into coal mining and railroad projects, forming Lehigh Coal & Navigation Company (LC&N Co.). In 1848, wire rope from their wire rope factory in Mauch Chunk, Pennsylvania provided the lift cables needed to complete the Ashley Planes Project. This project sought to improve the performance and appearance of the freight railroad that ran through Ashley, Pennsylvania, by adding lift cables. This increased tourism and increased the railroad’s coal capacity. Before, cars took almost four hours to return; after, they took less than 20 minutes. Wire rope likewise changed the landscape (again) in Germany, in 1874, when an engineering firm called Adolf Bleichert & Co. used wire rope to build Bi-cable aerial tramways. These allowed them to mine the Ruhr Valley. Several years later, they also used wire rope to build tramways for the German Imperial Army and the Wehrmacht. These tramways were wildly successful, opening up roads in Germany and all over Europe and the USA. Since the 1800s, manufacturers and engineers have found ways to improve wire rope, through stronger materials and material treatments, such as galvanization, and different rope configurations. Today, wire rope makes possible many heavy industrial processes. It has become a necessity of the modern world. Strands are made by tightly twisting or braiding individual wire together. One strand could have anywhere between two and several dozen wire filaments depending on the necessary strength, flexibility, and weight capacity. While they sometimes use other metals, like aluminum, nickel, copper, titanium, and even bronze for some applications, manufacturers primarily produce wire rope from steel. This is because steel is very strong and stretchable. Among the most common types they use are: galvanized wire, bright wire, stainless steel and cold drawn steel. Of the wire rope steels, cold drawn carbon steel wire is most popular, although stainless steel wire rope is sometimes employed as well. Stainless steel rope is most popular for its anti-corrosive properties. Bright wire rope, a type of ungalvanized steel wire rope, is also popular. For added strength and durability, galvanized steel wire rope/galvanized steel cables are a very popular choice. Galvanized aircraft cable, for example, is always a must in aerospace. When choosing or designing a custom wire rope for your application, suppliers consider factors such as: the environment in which the rope will function, required rust resistance, required flexibility, temperature resistance, required breaking strength and wire rope diameter. To accommodate your needs, manufacturers can do special things like: make your rope rotation resistant, color code your rope, or add a corrosion resistant coating. For instance, sometimes they specially treat and coat a cable with plastic or some other compound for added protection. This is particularly important to prevent fraying if the wire rope is often in motion on a pulley. 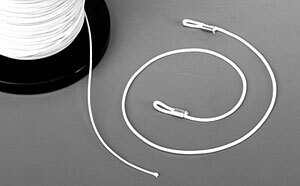 Manufacturers and distributors identify the differences in wire cable by listing the number of strands and the amount of wires per strand so that anyone that orders understand the strength of the cable. Sometimes they are also categorized by their length or pitch. Common examples of this include: 6 x 19, 6 x 25, 19 x 7, 7 x 19, 7 x 7, 6 x 26 and 6 x 36. More complex wire rope identification codes connote information like core type, weight limit and more.  Any additional hardware like connectors, fasteners, pulleys and fittings are usually listed in the same area to show varying strengths and degrees of fray prevention. Still others are identified in other ways. Below are some common wire rope types, not identified by any of the ways mentioned above. Cable wire rope is a heavy-duty wire rope. To give it its high strength, manufacturers construct it using several individual filaments that are twisted in strands and helically wrapped around the core. A very common example of cable wire rope is steel cable. Spiral rope is made up an assemblage of wires with round or curved strands. The assemblage features at least one outer layer cord pointed in the opposite direction of the wire. The big advantage of spiral ropes is the fact that they block moisture, water and pollutants from entering the interior of the rope. Similarly, stranded rope steel wire is made up of an assemblage of spirally wound strands. Unlike spiral rope, though, its wire patterns have crisscrossing layers. These layers create an exceptionally strong rope. Stranded rope may have one of three core material types: wire rope, wire strand or fiber. Wire rope chain, like all chains, is made up of a series of links. Because it is not solid, wire rope chain is quite flexible. At the same time, it is prone to mechanical failure. Wire rope slings are made from improved plow wire steel, a strong steel wire that offers superior return loop slings and better security. The plow wire steel also shields rope at its connection points, which extends its working life. Wire rope slings, in general, provide their applications with increased safety, capacity and performance. Wire rope sling is a rope category that encompasses a wide range of sub-products, such as permaloc rope sling, permaloc bridle slings and endless slings. These and other wire rope slings may be accompanied by a wide variety of sling terminations, such as thimbles, chokers and hooks. Wire rope offers its user many advantages. First, design of even distribution of weight among strands makes it ideal for lifting extremely heavy loads. Second, wire rope is extremely durable and, when matched properly to the application, can withstand great stress and elements like corrosion and abrasion. In addition, it is very versatile. Its many iterations and the ways in which the rope can treated means that users can get rope custom fit for virtually any application. Depending on the type of wire rope with which you are working and your application, you may want to invest in different accessories. Among these accessories are: wire rope clips, steel carabiners, fittings, fasteners and connections. To ensure that your wire rope quality remains high, you must regularly inspect them for wear and degradation. The right wire rope should be selected for a particular use. Watch out for performance-impacting damage like: rust, fraying and kinks. To make sure that they stay in tip-top shape, you should also clean and lubricate them as needed. Check for this need as a part of your regular inspection. Rope care is about more than inspection. It’s also about making an effort to use and store them properly every time you use them. For example, never exceed your rope’s rated load and breaking strength. Doing so will not only cause the weakening of your cable, but it may even cause immediate breakage. In addition, always store your wire rope cable in a dry and warm area, away from those elements that could cause premature rusting or other damage. Finally, always carefully wind your wire rope when you’re done with it, so as to avoid kinks. If you follow all these tips and treat your wire rope assemblies well, they will reward you with a long and productive service life. Always make sure that you purchase wire rope that matches your industry and regional standards. Some of the most widely referenced standards organizations for wire rope include: ISO, ASTM International and OSHA. Talk over your specifications and application with your wire rope supplier to figure out what’s best for you. If you’re in the market for a wire rope or a wire rope assembly, the best way to know you’re getting something that will both perform well and be safe if by working with a vetted professional. Find one among the list we’ve provided on this page. Check out their profiles to get an idea of the services and products they offer. Pick out three or four to whom you’d like to speak, and reach out. Talk to them about your specifications, standard requirements and budget. Ask about lead times and delivery options. Once you’ve spoken with all of them, compare and contrast their answers. You’ll know you’ve found the one when you talk to a wire rope company that is willing to go above and beyond for your satisfaction.